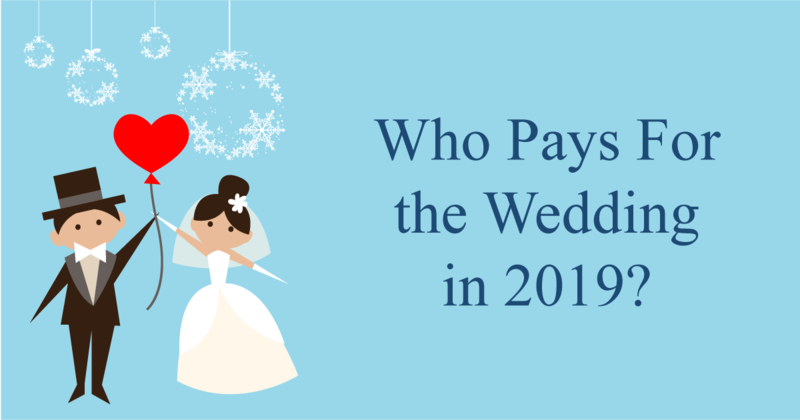 Who Pays for the Wedding in 2019? Today’s blog is one in a series that answers the questions that everyone asks before they attend or plan a Wedding. So whether the Wedding you are attending is your best friend’s or a distant relative’s, let Kevin Smith Transportation Group (and our Wedding experts) be your guide to all things Wedding in the greater Philadelphia, PA area. If you are looking for the industry’s most luxurious Wedding Transportation company, call 610-222-6225 today and speak to a Kevin Smith Transportation Group Wedding Coordinator. Your dedicated Coordinator will help you arrange all of your transportation, from Limos to Party Buses to Shuttles. Not everyone is a Wedding expert. Here at KSTG, we work with some of the most respected Wedding Professionals in the business. Today’s blog will answer one of the most asked questions out there. Who pays for the Wedding in 2019. You may have heard of the old-fashioned rule that certain people have to pay for certain wedding costs. But don’t worry, the bride’s parents definitely don’t need to take out a mortgage to pay for the wedding. Also, if you’re like most couples, the two of you might even be covering a good portion of the expenses yourselves. The best way to work it out? Sit down with a trusty pencil and paper and figure out what you want and can afford. Below is the traditional breakdown (as in the bride’s versus groom’s families’ typical responsibilities) of costs for everyone involved according to leading Wedding Planners in the greater Philadelphia area. But hear us out: These might seem like rules, but they’re not set in stone. Feel free to follow or stray from them based on what’s best for your financial circumstances. What we are showing below is just the traditional rules for Weddings. Who Pays for the Ceremony? Bride and family pay for church or synagogue, sexton, organist and so on. Groom and family pay for marriage license and officiant fee. Who Pays for the Wedding Attire? Bride and family pay for bride’s dress, veil and accessories. Groom and family pay for groom’s outfit. All attendants pay for their own clothing, including shoes. Who Pays for Flowers and Decorations? Bride and family pay for floral arrangements for the ceremony (including a chuppah if it’s a Jewish wedding ceremony) and reception, plus bouquets and corsages for bridesmaids and flower girls. Groom and family pay for the bride’s bouquet, boutonnieres for men and corsages for mothers and grandmothers. Groom and family pay for the complete honeymoon. Who Pays for the Photography? Who Pays for the Prewedding Parties? Bride’s or groom’s family plans and hosts the engagement party; if there’s more than one, the bride’s family hosts the first one. Groom’s family plans and hosts the rehearsal dinner. Maid of honor and bridesmaids host the bridal shower and bachelorette party. Best man and groomsmen host the bachelor party. Friends may throw additional engagement parties or showers. Who Pays for the Reception? Bride and family pay for all professional services, including food and decorations. Groom’s family pays for the DJ or band and liquor. Who Pays for the Rings? Bride and/or her family pay for the groom’s ring. Groom and/or his family pay for both of the bride’s rings. Who Pays for the Stationery in 2019? Bride and family pay for invitations, announcements and wedding programs. Who Pays for the Transportation in 2019? Bride and family pay for wedding transportation of the wedding party to and from the ceremony and reception. Thank you for reading today’s blog on the most asked Wedding questions. Please visit us next week as we continue to provide content on what you want to know most about. Visit our website to learn more about Kevin Smith Transportation Group’s services that we provide and check out our custom webpage on the #1 rated Wedding Transportation company in the greater Philadelphia, PA area.